Vermont has one of the highest rates of patents per capita in the country. Every year, the state produces dozens of inventions and innovations that get certified by the U.S. Patent and Trademark Office. The “Patent Files” is a new Tech Jam News series that profiles those inventors. Many of Vermont’s patent seekers work for companies such as IBM and Husky Injection Molding Systems, or for educational institutions such as the University of Vermont. UVM recognizes its new patent holders every spring at its Invention2Venture conference, which draws students, researchers, entrepreneurs and business leaders for a day of education and networking. The 2013 event took place on April 4 at the Dudley H. Davis Student Center; Rich Tarrant, CEO and founder of Winooski-based MyWebGrocer, was the keynote speaker. Before Tarrant took the stage, officials from the Vermont Technology Council and UVM’s Office of Technology Commercialization recognized the nine UVM-affiliated scientists and inventors whose patents had been granted in the last year. Mercedes Rincon was one of them. 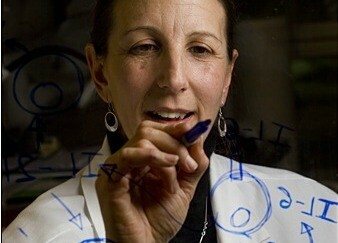 Rincon is a professor in the medical school’s immunobiology program. 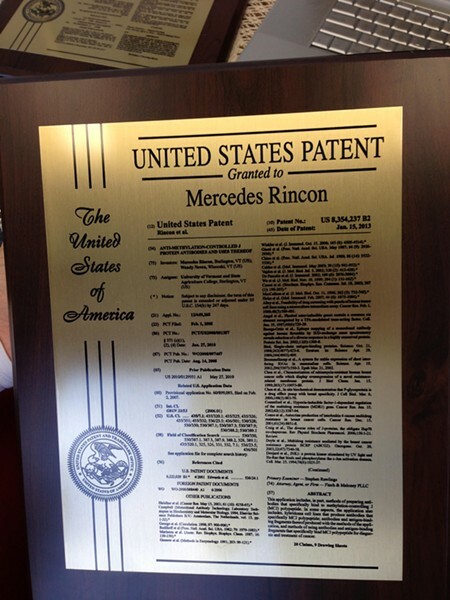 Rincon received two honors that afternoon — one for her patent, and one for having licensed it to Burlington-based BioMosaics, which is marketing her discovery. How did she get the idea for that patent? Rincon, 49, refers to her work on the MCJ protein as a “Thanksgiving experiment.” The gregarious Burlington scientist is single, so she receives multiple invitations to spend holidays with colleagues and friends. She prefers, however, to spend those days in her lab. “I used to devote the day of Thanksgiving to special experiments,” she explains.